The Norwegian Browser company, Opera, has announced the release of Opera Mini 5.1 for Android phones today. Opera Mini provides a “lightning fast” browser experience by virtue of its proxy service. Servers over at Opera receive page requests from the Opera Mini browser, and download the page. By reflowing text and compressing images, this allows pages to be downloaded faster than a browser loading the original page. The disadvantage here is a lack of privacy, and indeed the proxy service will break some sites that require a login, and internet banking is a definite no-no for any proxy-based browser. 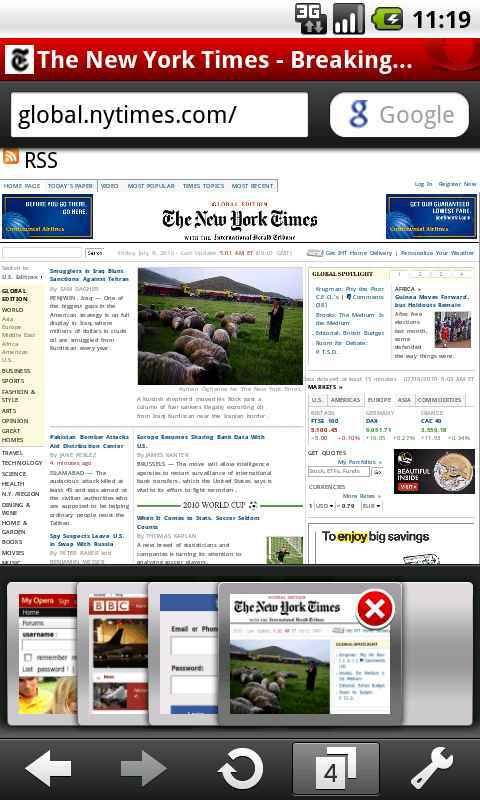 Opera Mini also provides functionality to synchronise bookmarks with other Opera Mini installations on other phones and with the desktop Opera browser. There are other handy features like “speed dial” which provide quick links to favourite sites. 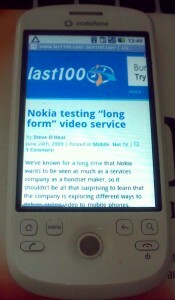 Opera Mini also supports full copy and paste for grabbing and using text from web pages. When Motorola unveiled its Droid smartphone in the US, it was critically acclaimed and hailed by many as the Android smartphone to beat at the time and, of course, like any high end touchscreen smartphone, branded as a potential iPhone contender. 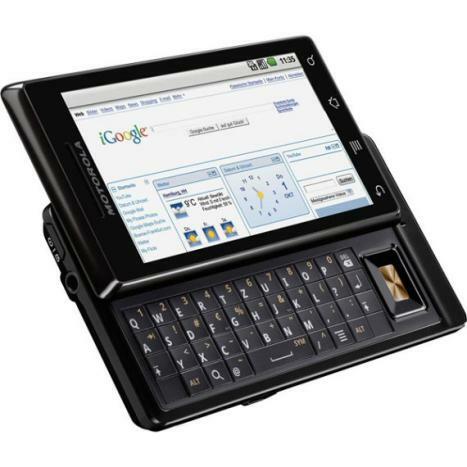 The story this side of the pond, where it was released as the Motorola Milestone, couldn’t be more different, however. It, as far as I can tell, hasn’t been picked up by any of the UK carriers to be sold with subsidy and instead can be picked up in its unlocked, unbranded form only. I’ve had the device on-loan for a while now and I have to say, for such a capable and in many respects rock-solid offering, the Milestone sure has divided opinion amongst friends and colleagues. I didn’t have as long with HTC’s Legend as I normally require for a full review – so I’m going to keep it short. To sum up the Legend: it takes everything we liked about its predecessor, the HTC Hero, and turns it up a notch. 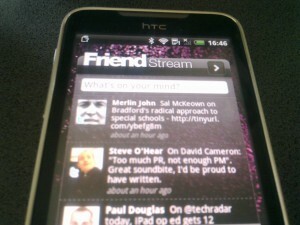 As regular readers may remember, the HTC was the phone that restored my faith in Google’s Android, largely because of HTC’s Sense UI, which adds much needed polish to the out-of-the-box Android experience and other improvements, such as social networking integration, a better virtual keyboard and web browser. Even though touch screen phones are more popular than ever, many people who enter a lot of text on their phone still prefer a physical keyboard (Ed. That’s me alright.) The need for tactile feedback is often cited as the reason. However, it’s likely that tactile feedback is preferred so that users know that they’re going to hit the correct letter, before they actually press it. Which is why haptic feedback on touch screens doesn’t actually help typing speed as it comes far too late – it vibrates after you’ve hit the wrong key. US start-up, ThickButtons, think they have the answer. At this year’s CeBit, Motorola showed off a cordless landline telephone running Google’s Android operating system, as reported by Engadget earlier this month. Known as the HS1001, the device is built by Binatone, and is expected to ship in the third quarter of this year with a price tag of $150. The hardware sports a 2.8″ touch screen and loud-speaker. And as you’d expect, the handset uses DECT technology, but surprisingly, it also has WiFi. The phone won’t carry the Android market place, however, or even have Skype installed, though you’ll still be able to access email and browse the web just as with any other Android phone. The Google-led Android mobile OS continues its rapid development with version 2.0 nearing release. A 2.0 milestone is rarely insignificant and Android doesn’t disappoint. Perhaps the biggest enhancement isn’t an end user feature as such but a new API that will enable handset makers and other third-party developers to add additional ‘Cloud’ syncing capabilities to Android’s contact application, taking it far beyond the existing support for Google Contacts. This could be Facebook or any social network or web app and to the end user will feel very much like the contacts element of Palm’s Synergy feature, Motorola’s MotoBlur, the work that INQ have done or HTC Sense on the Hero and Tattoo, two existing Android-powered devices. In other words, this whole cloud-savvy universal address book concept is already in wide circulation and now Google just made it even more pervasive. 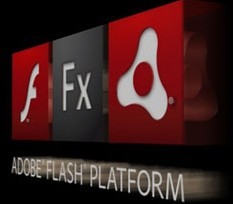 Adobe has long talked up its ambition to have Flash running on all manner of screens, not just the humble PC, and today the company got a lot closer to walking the walk not just talking. Through the Open Screen Project, Adobe was already known to be working with smartphone platforms from Palm (WebOS), Nokia (Symbian) and Microsoft (Windows Mobile), along with a raft of content providers, chip makers and consumer electronics companies. Today, the company added Google and Research In Motion to the list, with relation to Android and Blackberry-powered smartphones respectively, leaving Apple’s iPhone as the odd one out regarding planned support for full Flash (or any Flash support at all). Let me preface this by saying that there is a lot to like about Android and that the smartphones being powered by the Google-led OS are going to get better and better. I’m especially excited by the UI customization that HTC and Motorola, for example, have been developing on top of Android, testament to the mobile OS’s overall potential and, of course, openness. However, having lived with the Vodafone HTC Magic for a few months now, there are a few things that really bug me about the standard version of Android. Yes, this is going to be a bit of rant. On stage live at GigaOm’s Mobilize 09 conference, Motorola just unveiled a large part of its comeback strategy (there seems to be a lot of “comebacks” in the handset market at the moment) based on a new smartphone powered by Android, the Google-led mobile OS, featuring a custom UI that puts social networking at its heart. 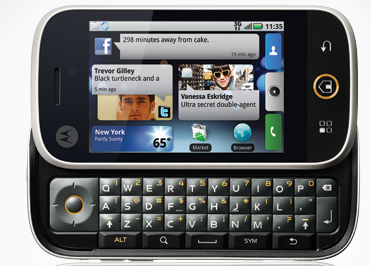 The phone, to be called the Motorola Cliq and offered exclusively on T-Mobile in the US, and the Motorola Dext in Europe, features 3G, WiFi, a 3.1 inch touch screen, slide-out landscape keyboard, and 5 megapixel camera, amongst its specs.